“Supporters of Vancouver’s last working farm will file into the Metro-Vancouver Board offices Friday morning to present 15-thousand signatures in favour of saving the UBC farm. Read the full (and short) story here. If you’re like me, you might not have even known that such a thing as ‘Electoral Area A‘ existed. But hey! It does! And there’s an election there soon! Apparently in the last municipal election only 4% registered voters in the area voted. Pretty shabby. But this time, for all of you Electoral Area A residents, your vote will actually mean a lot to the Farm. All four respondents (Maria Harris did not participate in the interview) answered “Yes,” some elaborating more than others. Fred Pritchard (no website) gave a one-word “yes”, Charles Menzies declared his support to have “no qualifications”, Matt Naylor was “unequivocal” about his, and Ben West upped his credentials with mention of his leadership role in the Save the Farm campaign. We’ve also seen both Ben West and Charles Menzies in attendance and being vocally supportive of the Farm’s preservation at UBC’s most recent round of campus planning consultations. The others may have been as well, but West and Menzies were strong, active participants in the sessions we were privy to. That definitely bolsters our opinion of each of them. Fall is my favorite season, the leaves change into a brilliant array of colors, the weather becomes cooler, students return to school, we return to a regular work schedule and it gives us a reason to find someone that we enjoy being cozy with. Fall signifies the return to routine, Thanksgiving, Halloween, Remembrance day, family, friends, the all too early marketing for the holidays, and squash!!!. On the farm as an apprentice, fall is the time to harvest the plethora of squash that we planted earlier in the year (Mark May 28 on your calenders as the sowing date for Neon Pumpkins). Squash soup, pumpkin pie, roast squash and pumpkin carving! I was very proud when I carried a pumpkin that I had planted, grown and harvested onto BC ferries to gift to my friends in Victoria for Thanksgiving. No matter the weather these large cucurbits densely packed with caloric energy linked my Thanksgivings in Ontario to my Thanksgiving here, not to mention the turkey…but I digest. I’ve made great friends here in UBC’s pumpkin patch, learned more about myself and have seen what true conviction and character exists in the young farmers that are critical to the future of our food supply. As we set aside some pumpkins for children to harvest in the near future, the rain subsided and the sun presented itself, I hoped that many more will pass through the farm gates and will be allowed this amazing opportunity that I am thankful for having been afforded. 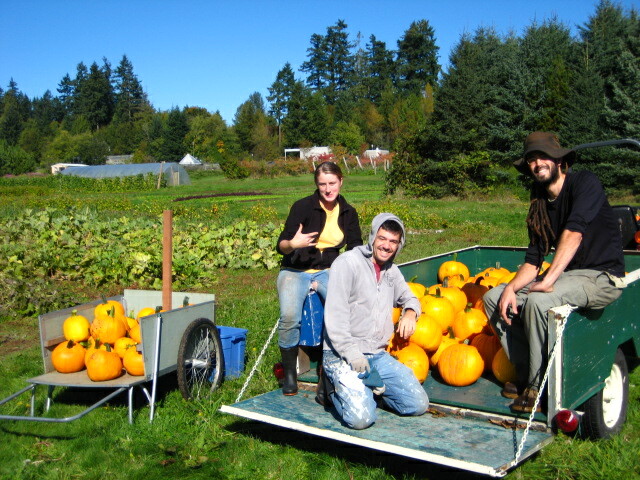 These squash represent the end of my apprenticeship at UBC, the great people that I have befriended and new beginnings. While I should probably end my first and only blog entry with an inspiring quote by an iconic farmer I will resist and use my own words: No matter where you spend the fall there will always be squash and great people to surround you, your biceps may even get a little bigger. Yesterday marked the Friends of the Farm’s entry into the world of news media, as we held our first-ever press conference to announce the handover of over 16,000 signatures on our petition to save the Farm. Andrea Morgan and Matt Filipiak, along with others, met with UBC President Stephen Toope and Vice President Stephen Owen last night and presented them with a huge stack of petitions signed by UBC staff, students, faculty, and community members near and far. Each UBC administrator also received a homemade pumpkin pie, made with UBC Farm’s luscious Cinderella pumpkins. Here’s to hoping that the stack was big enough and the pies delicious enough to secure Toope and Owen’s support! UBC Campus and Community Planning is currently nearing the end of a consultation process that includes three proposals for the future of the Farm. All three proposals remove the Farm’s necessary buffer and reduce the Farm’s size to 7-8ha. Effectively eliminating any further growth potential. Two of the proposals even move the farm onto non-agricultural soils. 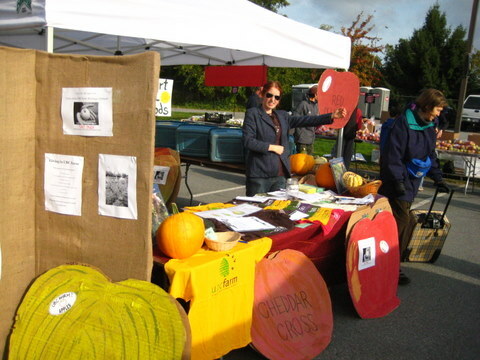 The Farm’s programs have been growing by 50% in each of the last 6 years. This growth is a result of demand and although the growth will reduce in future years, the Farm will still grow. The current options do not reflect the results of past consultations (some of which have been reported at campusplan.ubc.ca). The options also do not reflect the opinions of the acclaimed outside planners and designers who were brought together last spring for a series of design workshops. The mood is that none of the options are acceptable but I leave that for you to decide. The most effective response you can give is in speaking or writing to the UBC President, Stephen Toope, or VP External, Stephen Owen. Please tell them what you think of the planning and consultation process. Lastly the FOTF are submitting the petition to President Toope on Monday. They are holding a press-conference outside the SUB at noon and would like as many people as possible to attend. 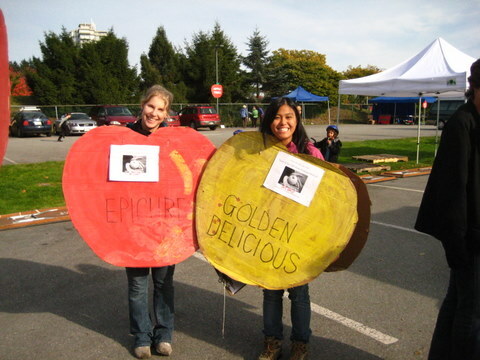 We raised ~ $1300 for the UBC Farm through sales and encouraged ~1700 petition signatures in two days!! AMAZING!! 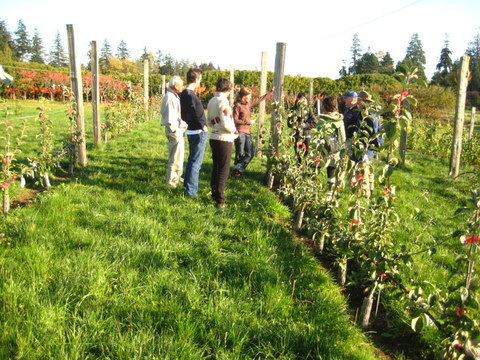 Also, 28 enthusiastic folks joined our tours of the new(ish) UBC Farm Heritage orchard ~ launching its career as an urban agricultural education site. Overall, a huge success. 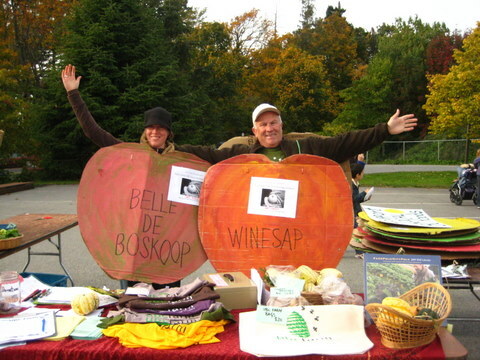 Thanks to all who came out and supported the UBC Farm and the Bot Gardens…. see you again next year! 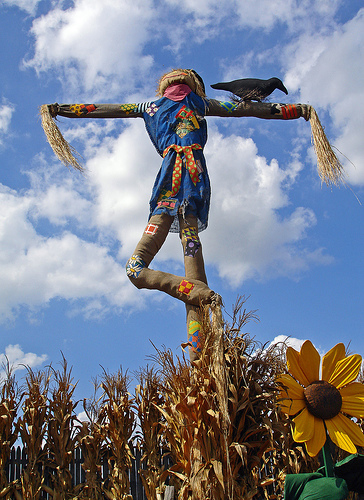 The Friends of the Farm are pleased to offer another year of build-your-own scarecrows, this Saturday, 11am-4pm. Bring your own out-grown and unloved clothes to re-purpose. We provide the wooden frames, twine, straw, extra material, supervision and warm drinks. Last year’s event was a big success, and we’re hoping you’ll bring your little ones out and join us again this year! Please email Ayla at ubcfarm.volunteer@gmail.com if you can help out!